Friday’s wide spread down bar finished off the week for the usd to cad in bearish tone, making this the fourth straight day of losses for the pair. With the US dollar looking weak on the USD index, this momentum seems set to continue this week, with the only technical issue being whether the 1.065 level will be sufficient to halt the progress lower, which at this stage looks increasingly unlikely. 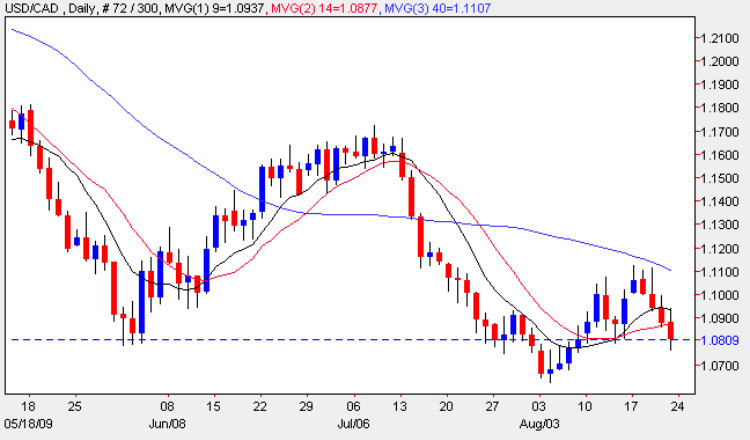 Friday’s bar also broke and closed below the 14 day moving average adding further weight to out forex analysis for the usd cad pair, and with all three moving averages now adding their own downwards pressure, my trading suggestion for tomorrow is to once again look for small short positions on an intra day basis, and with an initial target in the 1.07 price region. Should we see any resurgence in the US dollar, then there is plenty of strong resistance above to provide a degree of protection from any upward short squeeze. Canada provides the only important piece of fundamental news on the economic calendar today with the release of both Retail Sales and Core Retail Sales figures, with the first forecast to be flat at 0.0% and the second at 0.2%. Both these numbers are expected to be worse than last time at 1.2% and 0.7% respectively, and with no news in the US, these figures could provide a degree of movement in the currency pair once the New York forex trading session gets under way.